WHEN he found out there was a Filipino martial art that specialized in weapons, 17-year-old John Bernard S. Romanes decided he wanted to learn it. The Qatar-raised Pinoy was already into martial arts, having studied karatedo and taekwondo but learning the Filipino martial art became a desire. “I was interested in handling weapons and knowing that we have a Filipino martial art in handling weapons, it was a no-brainer for me to study arnis,” said Romanes, who took home a silver medal in the heavyweight division in the Philippine Eskrima Kali Arnis Federation World Invitational Championships at the SM Seaside. After a few hiccups, he eventually found himself at the Empower Sports Center in Doha, Qatar. Owned by Sulaiman Ali Karimy, the center offers various disciplines and among them is eskrima, which is handled by Grandmaster Jose Eric A. Mosqueda. The Cebuano grandmaster started practicing the art when he was seven under the auspices of Supreme Grandmaster Dionisio, his uncles Cacoy and Momoy and SGM Diony’s father himself, Eugelio. It was the perfect time for the two to meet as Grandmaster Mosqueda was establishing himself as the World Eskrima Kali Arnis Federation (Wekaf) director for Qatar, tasked with spreading the sport in the Middle East. And after years of establishing informal schools, Mosqueda, who spent nine extensive years from seven to 16 training under the legends, was establishing a formal school in Qatar. But he did finish his Civil Engineering degree at Cebu Institute of Technology in 1983 and by then, work took over and his eskrima practice was limited to the weekends. Work would eventually find the grandmaster getting assigned in various places—Palawan, where he met his wife Gigi, Southeast Asia, Saudi Arabia and eventually Qatar. “I’ve been given the privilege to spread eskrima in the Middle East. As the Wekaf director for Qatar, my vision is to encourage the locals to learn it,” he said. He admits it is a challenge as the No. 1 interest in the 2022 Fifa World Cup host is football. Even the Filipinos in Qatar aren’t interested in the sport or are not aware what Eskrima is, something his student can relate to. When he is with Filipino friends in Qatar and the topic of his being involved in arnis is raised, the most interest Romanes’s friends show is to ask for a demonstration. 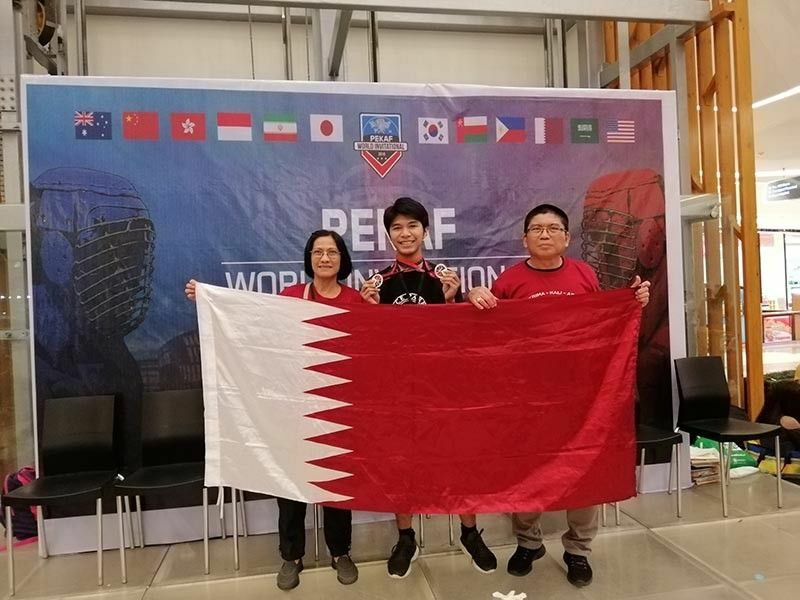 But the interest among foreigners is a different thing and Grandmaster Mosqueda cited the case of a British martial artist who spent almost two years asking Filipinos in Qatar if they knew of an arnis teacher. “He would ask every Filipino that he met, even the waiters in the hotel, but they didn’t know anyone,” he said. In fact all of the grandmaster’s students, who are from Sudan, India, Algeria, Tunisia, Sri Lanka, France and the UK, are mostly blackbelt holders of other martial arts who want to appreciate eskrima. But how can GM Mosqueda break through the disinterest of Pinoys in the sport and teach eskrima? By breaking their misconceptions about it. And he proceeded with a brief demonstration, showing this writer how to block a knife attack with a ballpen and how to go from defense with a ballpen to offense with that same innocent ballpen. A knife attack is the common man’s worst nightmare and grandmaster Mosqueda makes sure that anyone who gets even as brief as one session with him will know how to defend himself or herself from one. There’s no secret to it as Grandmaster Mosqueda follows SGM Diony’s philosophy when it comes to martial arts, that it should be shared. “What good is knowledge if it is not shared? You may be a good martial artist but if your knowledge dies with you, then you’re not good,” he said.